SARVER, PA – September 23, 2018 - Brad Sweet’s fantastic 2018 season continued Saturday night at Lernerville Speedway when he passed Donny Schatz on Lap 28 to become the fourth and final different leader of the 2018 Commonwealth Clash for his eighth win on the year. Schatz settled for second with former Lernerville track champion Tim Shaffer completing the podium. After consecutive Yellows on Lap 1, the field lined up single-file. Shaffer went for the slide job to take the lead on the restart, but Pittman turned it back under to maintain control. Shaffer was relentless in pursuit of Pittman and took the lead off of turn four to lead Lap 6 to the delight of the hometown crowd. During the long Green Flag stretch, Shaffer established a healthy lead through the heavy traffic. Donny Schatz got underneath Pittman to take second on Lap 18 and set his eyes on Shaffer. Sweet continued his way forward getting by Pittman and getting an up-close look on the battle for the lead between Schatz and Shaffer. Schatz got a good run off the cushion in turn four to slide Shaffer into turn one to take command on Lap 22. A lap later Sweet slid in front of Shaffer as the top two in Outlaw points established themselves as the class of the field as they have so many times this season. Sweet got a massive run on the nine-time Series Champion out of turn two and blasted underneath to take the lead down the backstretch and officially lead Lap 28. Sweet powered away and looked to be well on his way to his eighth victory of the year, but a caution for sixth-place running Sheldon Haudenschild with three laps to go put the celebration on hold. With less than five to go in the Feature World of Outlaws rules dictate a single-file restart, which allowed Schatz to attempt a slide job for the lead. Sweet powered around the Schatz slider to maintain the lead down the backstretch and go on to win his first Outlaw Feature at Lernerville. “I struggled for the first few years of my career at this track, it’s nice to come here and be as fast we’ve been this year. The track was great, there were so many options of where to go in lapped traffic. You could rimride on that thin ledge or get going around the bottom,” Sweet said in Victory Lane in appreciation of the racing surface. “This one is for Greg Hodnett, he was a good friend of mine. It’s been a tough year. We’ll celebrate this one a little for him and move on to the next one,” Sweet said with his heart on his sleeve. Donny Schatz bounced back from an uncharacteristic bad night at Eldora to finish second. “The track was tricky tonight, second isn’t bad, especially considering the night we had last night,” Schatz, who was forced into a Provisional for the first time in 2018 last night, said with a little grin. When asked about the late-race restart, Schatz was honest. “I didn’t have much grip and I’m not going to use Brad up or run myself off the track. Luckily, I have these [crew] guys behind me and we’ll have more grip next time we come back,” Schatz said positively. Tim Shaffer completed the podium and complimented Sweet and Schatz. “Those guys are on their game and third isn’t too bad against these guys. Those [pointing at Sweet and Schatz’ team] teams are what we are trying to build up this team up to,” Shaffer said next to his DR Racing No.49X. Logan Schuchart was strong for the second consecutive night coming home fourth with Daryn Pittman completing the top-five. Central Pennsylvania invader Danny Dietrich earned KSE Hard Charger Honors coming from 14th to sixth. 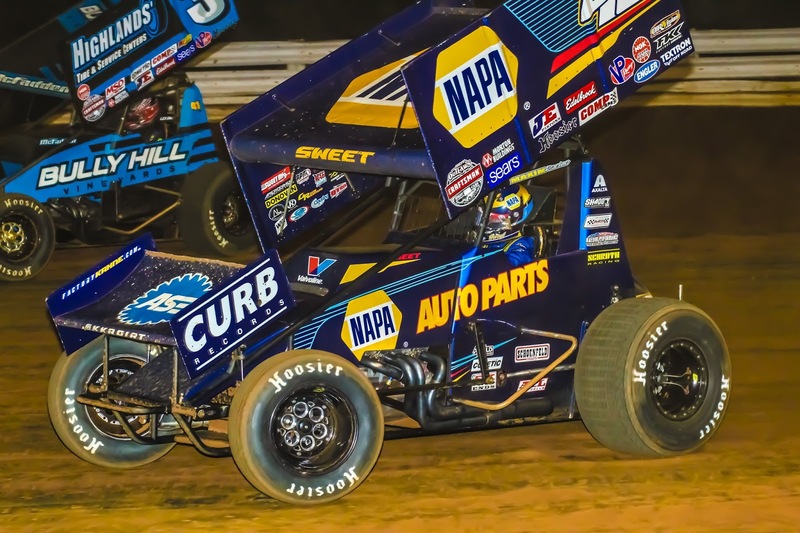 The World of Outlaws Craftsman Sprint Car Series heads into Central Pennsylvania next weekend for the Champion Racing Oil National Open against the Pennsylvania Posse at Williams Grove Speedway. Saturday’s Feature at The Grove will pay $56,000 to win, making it the second-highest paying event on the World of Outlaws schedule in 2018. As always, if you can’t make it to the track, watch all the action LIVE on DIRTVision.com!